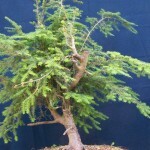 Eastern Hemlock (Tsuga canadensis) is rarely seen as bonsai because good material is hard to find. They bark up slowly, and grow in shady protected environments where exciting stunted material is rarely found. 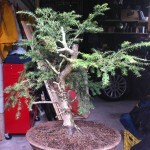 I’ve only seen two really good pieces of Eastern Hemlock yamadori that impressed me. One is dead now, and I have been trying (unsuccessfully) to buy the other one for awhile. 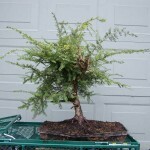 I’ve never seen a mature and refined T. canadensis bonsai. 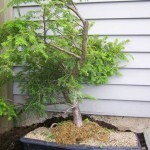 This Tsuga was one of the first decent trees I collected, back in 2007. It was growing in a dark understory near a trail were it was getting battered and bruised by passing vehicles. 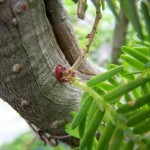 It has the beginnings of mature bark which is a sign of some age. Ring counts on a cut branch lead me to think the tree is 40-50 years old. It had a shallow root system growing in mostly leaf mold, and I took home a mostly intact rootball. It grew happily in the moldy compost for 3 years, sending out 3 extensions every season. The tree seemed very strong. Then, I had the bright idea to try and get it in a training pot and some coarse bonsai soil. The tree HATED it. Its growth slowed down, and the apex started to die back. It almost looked like a fungal attack, but whatever it was I am convinced that it was a symptom of a more fundamental problem – the soil mix. The lesson here it to grow T. canadensis in a fine, organic mix. It may be the low pH that they like. 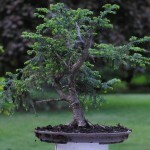 Many people know this already (see Nick Lenz Bonsai from the Wild 2nd Ed.) 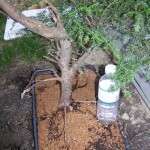 but I was stubborn and in a phase where I though “bonsai soil is better for everything”. 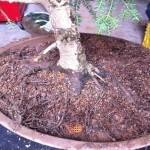 So this spring I raked about 80% of the bonsai grit out of the pot (without removing the tree). The root system looked pathetic. 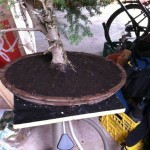 I packed in sifted top soil and hopefully this will help the tree to recover. If it doesn’t help, I am about ready to throw in the towel with this one. As a side notes, T. canadensis heals over wounds incredibly well. 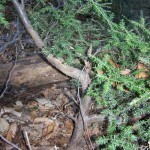 For such a delicate conifer, you would not expect it. This makes them suitable for grafting. 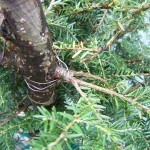 The first branch on the right near the top of this tree is a successful one-point graft. As discovered in Spring 2007. I think a tree fell on it a long time ago, and now it was growing in the compost of the rotting tree. Potted up after collecting. It was just thrown in a plastic tray and turface sprinkled in the gaps. Some one-point grafts were started the next year. 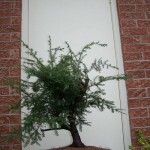 Here it is Spring 2010 showing its strength before I made the mistake of planting it in coarse inorganic bonsai soil (the stuff I use with all my trees). Progress of the graft (1 year after starting it). 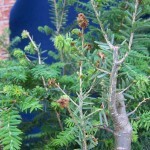 The tree showed weak growth that spring, and dieback in the apex. Here it is this spring, looking quite pathetic. 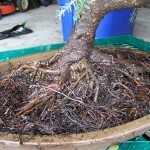 Without removing the tree from the pot, I raked and shook away most of the coarse bonsai soil. I replaced it with sifted black earth. Hopefully this will correct what I believe to be a pH issue, and the tree can regain strength. Here is the tree the other day. It seems to be growing well after its soil enrichment, but I will need more time to know if this solved the problem for sure. As a side note, the spring growth of hemlock is incredibly beautiful. Like yew or spruce, I find the spring growth of these trees just as nice as flowers. This entry was posted on May 21, 2012. 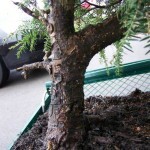 It was filed under Tsuga canadensis, Yamadori and was tagged with Bonsai, Eastern Hemlock, Tsuga canadensis.